Anodizing is an electro-chemical process used to increase the thickness of the natural oxide layer on the surface of aluminum parts. The process is called anodizing because the part to be treated forms the anode electrode of an electrical circuit. Anodizing aluminum increases the corrosion and wear resistance. 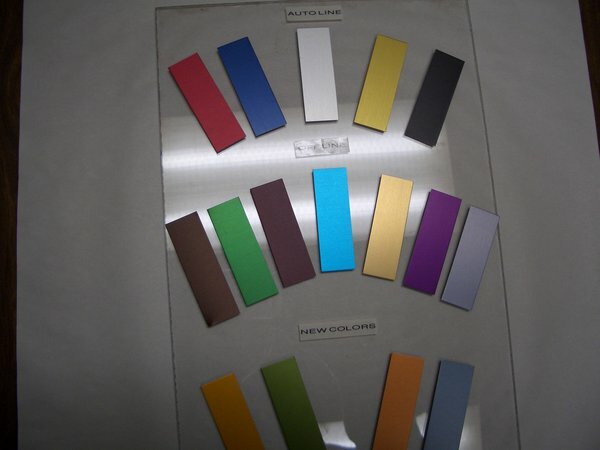 Anodic films can also absorb dyes into the oxide for cosmetic effects. The Military Specification referred to as MIL-DTL-5541, “Military Specification, Chemical Conversion Coatings on Aluminum and Aluminum Alloys” covers chemical conversion coatings formed by the reaction of chemical conversion materials with the surfaces of aluminum and aluminum alloys. The current specification (2009) is MIL-DTL-5541F, which superseded MIL-C-5541E in July 2006. The specification is approved for use by all departments and agencies of the United States Department of Defense (DoD). Although prepared specifically for DoD applications, the standard is used for many commercial applications as well. The MIL-DTL-5541 specification covers chemical conversion coatings that form protective coatings by chemical reaction with aluminum and aluminum alloy; these coatings are categorized by the following types and classes. Type I: Addresses compositions containing hexavalent chromium. Type II: Addresses compositions containing no hexavalent chromium. Class 1A: Provides maximum protection against corrosion, whether painted or unpainted. This is a relatively thick film used as a final finish or pre-treatment to paint or powder coating, and it is typically gold, brown, or yellow depending on coating weight and alloy. Class 3: Provides protection against corrosion where low electrical resistance is required. This is a thin film providing low contact resistance, and the coating weight is lower as is the corrosion resistance. There may be some advantages using this thinner film in bonding applications. This film typically appears to be a lighter color of gold. Stainless steel can corrode in service if there is exposed iron contamination on the surface. Passivation is a chemical treatment applied to the surface of stainless steel to remove contaminants and assist the formation of a continuous chromium-oxide, passive film which protects the surface from corrosion. Our citric and nitric acid solutions can passivate and treat various stainless steel alloys. Care must be taken in selecting and using passivation treatments to ensure the selected treatment will target the contaminant. Passivated parts undergo verification testing. We employ a number of verification tests (Copper Sulfate, Humidity, Salt Spray, etc.) to ensure your parts have been properly passivated.